Actor Rondo Hatton, whose face was so unique that it has been immortalized in bust form as a series of horror awards, was reportedly voted the best-looking boy in his class at Hillsborough High School in Tampa, Florida. Whether or not this story is apocryphal, we do know that Hatton didn’t always look the way he did when he starred as the hideous “Creeper” in a series of low-budget horror films in the 1940s. Born on April 22, 1894, Hatton worked as a sportswriter and served in World War I, after which acromegaly began to change his facial features. Acromegaly is a syndrome often associated with gigantism. It usually manifests in adulthood or middle age, and its progression is slow. It involves swelling of the soft tissues — particularly the hands, feet, nose, lips, and ears — general thickening of the skin, the swelling of internal organs, and the pronounced protrusion of the brow and lower jaw. While working as a reporter for the Tampa Tribune, he was spotted by director Henry King, who was in Florida to make Hell Harbor (1930). 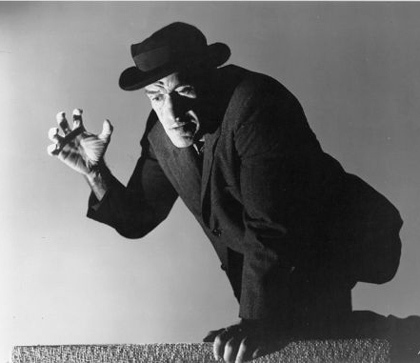 King hired Hatton for a bit part, and Hatton eventually moved to Hollywood, where he appeared in a series of small roles, most notably as a contestant in an “ugly man competition” in The Hunchback of Notre Dame (1939) and as a member of the lynch mob in The Ox-Bow Incident (1943). He first appeared as a character called “The Creeper” in the Sherlock Holmes thriller The Pearl of Death (1944), and then twice more in two horror films that were unrelated to the Sherlock Holmes series, House of Horrors and The Brute Man, both of which were directed by Jean Yarbrough. 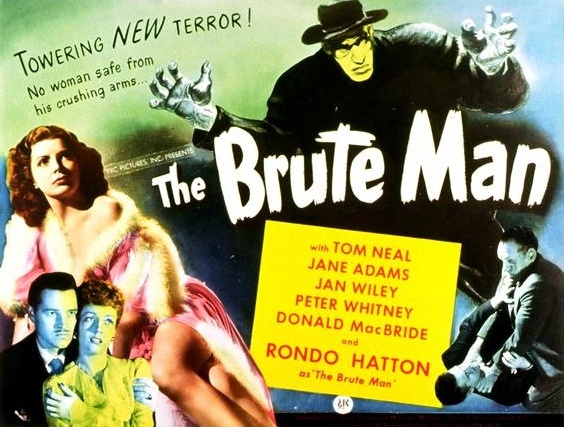 In The Brute Man, a once-handsome B.M.O.C. (big man on campus) who was disfigured in a lab accident prowls the city, killing for revenge. Spinning newspapers with headlines like “Back Breaker Claims Second Victim” fill in the missing details, as the viewer wonders why police can’t find the most unique and strange-looking person in the city, who is spotted in public plenty of times. After one of his murders, the Creeper takes refuge in the home of a blind piano teacher named Helen Paige (Jane Adams, who unfortunately never appears in that pink satin and white ermine number we see her wearing on the lobby card above). For no reason I could discern, she lies to the police about someone being in her apartment, and the Creeper climbs out her window and makes his escape. We eventually learn that the Creeper used to be a boy named Hal Moffet, a football star at Hampton University, who was popular and handsome, although his temper made him some enemies. 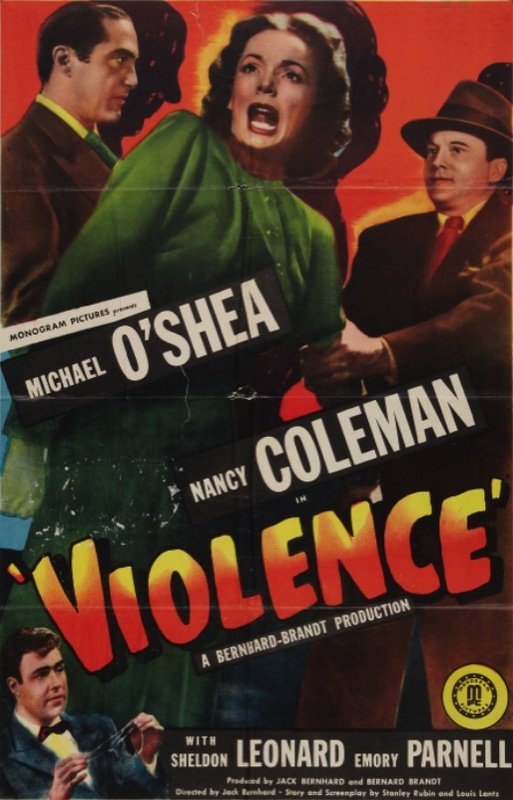 He and his friend Clifford Scott (Tom Neal) were in love with the same girl, Virginia (Jan Wiley). The night before an oral exam in chemistry, Cliff fed the academically impatient Hal the wrong answers so he’d be kept after class and not be able to score with Virginia. Naturally, the professor did what any professor would do with a student who bungled a quiz; he kept him after class working on a complicated and dangerous experiment. After seeing Cliff and Virginia through the window, Hal realized he’d been deliberately crossed up, and smashed a flask of chemicals on the floor. Unfortunately, the cloud of caustic smoke damaged his face, and he’s now hell-bent on getting revenge on everyone he thinks wronged him. Last on his list are Cliff and Virginia, who are now married. 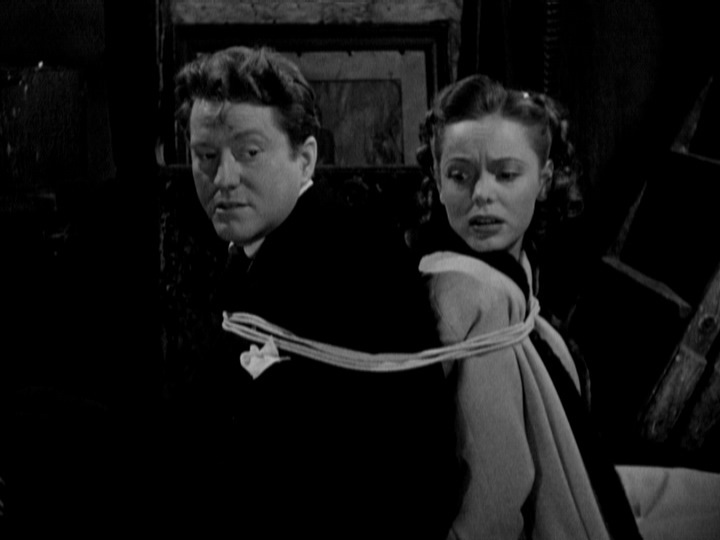 Hatton died on February 1, 1946, before either House of Horrors or The Brute Man were released. He was 51 years old, and his death was caused by a heart attack that was directly related to his disorder. He wasn’t much of an actor, but his appearance alone telegraphed pathos, and the renewed interest in Universal’s horror films in the ’60s and ’70s eventually turned him into a horror icon. Posted in 1946, October 1946 and tagged Ben Pivar, Donald MacBride, Dwight V. Babcock, Fred Coby, George Bricker, Hans J. Salter, Horror, Jack Parker, Jan Wiley, Jane Adams, Janelle Johnson Dolenz, Jean Yarbrough, John Hamilton, Joseph Crehan, Lorin Raker, M. Coates Webster, Mary Ann Bricker, Maury Gertsman, Oscar O'Shea, P.R.C., Peggy Converse, Peter Whitney, Philip Cahn, Rondo Hatton, The Brute Man, Tom Neal, Universal Pictures. Bookmark the permalink.